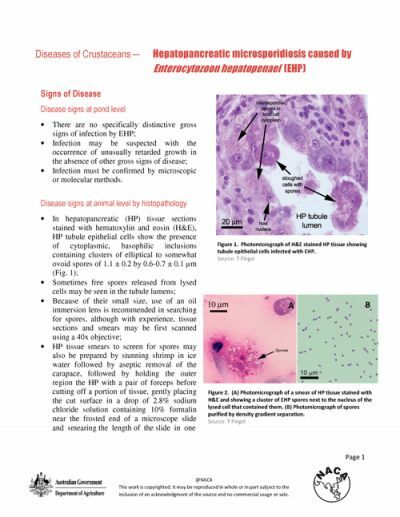 This disease card describes the diagnosis and range of a microsporidian shrimp pathogen, Enterocytozoon hepatopenaei (EHP), first discovered in Penaeus monodon in Thailand in 2004. It infects only the tubule epithelial cells of the hepatopancreatic tissue of shrimp. EHP was later found to also infect P. vannamei cultivated in Thailand and is suspected to have been reported from P. japonicus in Australia in 2001. EHP has been reported from Vietnam and is associated with white faeces syndrome. 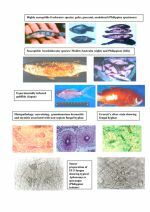 It resembles an unnamed microsporidian reported in the hepatopancreas of P. monodon in Malaysia in 1989 and in P. japonicus in Australia in 2001. PCR positive results have also been obtained from P. vannamei cultivated in Indonesia and India, thus it is probable that EHP is endemic in the Australasian region.